The other day, as I was watching the wildlife documentary on the Discovery channel, I saw the team of researchers in the program, using the Night Vision camera and goggles. They were able to capture the activities of the animals and locate each other, even in the dark moonless night. If you’ve ever been Intrigued on how these work, here is the working demystified. Before understanding the working of the Night Vision Goggles we should know a little about the light spectrum. What we see and perceive with our naked eyes is just a little portion of the light spectra, rightfully called, the visible spectrum. Light has other components too, namely Ultraviolet and Infrared spectrum. The infrared portion has a wavelength less than 700nm-1mm. 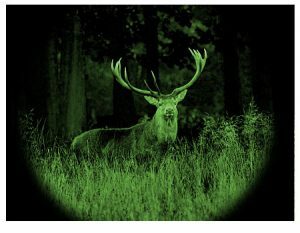 The Night Vision Devices (NVDs) use the infrared light to make things visible. Almost everything consumes or uses energy. Energy consumption by the atoms causes the electron to move to higher energy levels, which then eventually come back to the ground state. In doing so it releases a photon- a particle of light. These photons are usually fired off in the thermal-infrared spectrum. The hotter the object, the shorter wavelength will be of the photon it releases. It is this thermal radiation given off by the object, which is captured and processed by the NVDs. i. Thermal imaging – As explained earlier the NVDs use the infrared radiation emitted by the object. The heat emitted by the objects is captured. Hotter objects, such as warm bodies of animals or humans, emit more of this light while the cooler objects like trees or buildings emit leseer light. Therefore, the warmer bodies are easily detectable. ii. Image Enhancement – By this, we mean that the camera/goggles use the tiny amount of light present and enhance or amplify it to the point that we can perceive the image, which would otherwise have been invisible to the eyes. 1. The low amount of light enters the lens of the NVD. The light that is made up of photons enters the goggles and strikes the sensitive plate called photocathode. This photocathode converts the photons into electrons. 2. These electrons then move to the photomultiplier that is a kind of photoelectric cell. One electron is amplified or converted into many electrons by a factor of thousands through the use of a micro channel plate (MCP). An MCP is a tiny glass disc that has millions of microscopic holes (microchannels) in it, made using fiber-optic technology. The MCP is contained in a vacuum and has metal electrodes on either side of the disc. As electrons pass through the microchannels and therefore creating a cascade effect called cascaded secondary emission which is responsible for the multiplication of electrons. Basically, the original electrons collide with the side of the channel, exciting atoms and causing other electrons to be released. These new electrons also collide with other atoms. 3. A large number of electrons from the photomultiplier hit the phosphor screen and as a result create tiny flashes of light same as what happens in a television. These electrons maintain their position in relation to the channel they passed through, which provides a perfect image since the electrons stay in the same alignment as the original photons. The energy of the electrons causes the phosphors to reach an excited state and release photons. These phosphors create the green image on the screen that characterizes the night vision. 4. The green phosphor image is viewed through another lens, called the ocular lens, which allows you to magnify and focus the image. The NVD may be connected to an electronic display, such as a monitor, or the image may be viewed directly through the ocular lens. Because of the amplified or a large number of electrons than the number of photons what originally entered the goggles, the screen makes a much brighter version of the original scene. The screen collects the emitted electrons and converts them into visible light. The image is always monochromatic and the color is given by the type of the phosphorus used to coat the screen. The phosphors on their screens are deliberately chosen to make green pictures because our eyes are more sensitive to green light. Green light is easier to look at rather than the black and white images. Hence, the eerie green glow.